« Pinterest Travel-Are We There Yet? Taos New Mexico is a unique destination location to say the least. Set on an undulating mesa at the base of Sangre de Christo Mountains. A landscape that offers enticements for every season. ” It is a place of piercing light and spectacular views, where the desert palette changes almost hourly as the sun moves across the sky.” This wonderful description comes from AARP Taos Vacation Guide. There are destinations where artists are drawn throughout our vast country, from sea to shining sea and in between. Taos New Mexico has a rugged beauty and natural desert palette that have seduced artists, writers and photographers for over a century. Of course the Southwest Native American Indians have been painting and crafting there since ancient times. Both influences have enriched the Taos community. The desert landscape and low-key life style also draws abundant tourists. Many visit time and again and stay. There are so many reasons why. And the history is abundant and can be viewed within the adobe walls of ancient native dwellings, the Spanish haciendas and ‘newer’ turn of the 20th Century adobe homes. 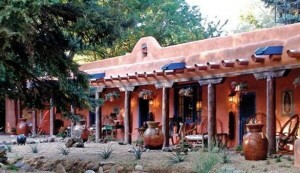 The Adobe & Pines Inn is located on a preserved 1832 historic adobe hacienda. Once owned in the late 1930s by a patroness to the arts. 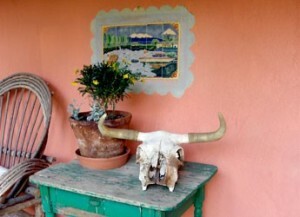 She transformed the hacienda into one of Taos’ cultural salons. A gathering place for celebrity artists like Georgia O’Keefe and other notables like writer D.H. Lawrence. The gathering of guests since the Inn opened in 1991 continues and thrives. 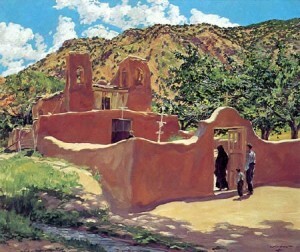 Taos New Mexico painter Walter Ufer ‘Where the desert meets the mountain’. Historic bed and breakfasts like the Adobe & Pines Inn can offer so much to their guests. The Inn’s history includes an acequia, transformed on the property into a lovely stream that is part of the ancient Spanish irrigation system. The Inn’s Grand Portal has a large fresco mural by Taos Pueblo artist Juan Mirabal circa 1950. Throughout the Inn’s walls are old wall tiles depicting saints and religious pilgrimages. A well preserved two portal adobe outhouse completes the historic picture (and experience)! 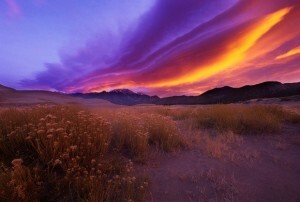 “Come Replenish Your Soul-Experience Taos-Experience Adobe History-Experience Your Soul”. This is how the current innkeepers describe what to expect at the Adobe & Pines Inn. They are ready to welcome new owners and caretakers of this special Inn in a very special destination location. If you are ready to experience the mystique and life style of the southwest. Taos New Mexico may be calling you, where the desert meets the mountain. This entry was posted on Wednesday, August 6th, 2014 at 4:47 pm	and is filed under Better Way to Buy and Inn. You can follow any responses to this entry through the RSS 2.0 feed. Both comments and pings are currently closed.